In my prior post, I took a look at some of the research behind what kinds of factors and situations might give rise to inappropriate use of sources in student writing. The list of possible motivations to commit plagiarism in all its forms is complex and, for me, a little daunting. There is a multitude of pitfalls and potential issues that accompany responsible source use; as our student bodies grow more diverse and our technological and digital access to resources grows more intricate and comprehensive, these issues continue to multiply exponentially. Acknowledging this, the essential question is, what do we as educators do about it? The effort from academic institutions and educators everywhere to fight what is commonly referred to as the “Plague of Plagiarism” is immense. As Rebecca Moore Howard points out in her article, an entire industry based on retroactively catching instances of plagiarism has developed, with sites like Turnitin.com and Plagiarism.org regularly devising new strategies for catching the culprits. Software is being developed, articles are being written, books are being purchased. Teachers everywhere are cracking down on plagiarism. The problem with this mentality and one of the myriad of reasons it has been relatively unsuccessful is that this approach is fundamentally retrospective. The instances of plagiarism are detected after they have happened, leading to a predominantly punitive set of responses that does not even attempt to address the reason the student plagiarized in the first place. Keith Hjorthshoj and Katherine Gottscholk acknowledge that this problem has arisen from the overwhelming complexity of the plagiarism problem. “Because it is impossible to prevent all forms and cases of plagiarism, teachers often devote their attention to detection and punishment, partly in the interests of deterrence” (Teaching English 119). Another significant reason for the lack of success in recent efforts to combat plagiarism has to do with our modern understanding of what plagiarism is, which is something I get into in an earlier post in this series. Howard touches on this when she says, “We like the word ‘plagiarism’ because it seems simple and straightforward: Plagiarism is representing the words of another as one’s own, our college policies say, and we tell ourselves, ‘There! It’s clear. Students are responsible for reading those policies and observing their guidelines’.” This kind of simplistic, but well-intentioned thinking about plagiarism does indeed simplify our responsibilities as teachers, but at what would seem to be too high a cost. Given the ineffectiveness of retroactive responses to plagiarism as well as a general sense of confusion surrounding what plagiarism actually is, Hjortshoj and Gottschalk suggest a better way. They believe that a proactive approach to writing education has the ability to counteract many of the reasons students have for relying on inappropriate source use. “To a great extent… prevention is possible and coincides with the goals of education” (Hjortshoj and Gottschalk Teaching English 119). For starters, this approach requires that educators take a moment to deepen and stretch their definitions of what constitutes plagiarism (feel free to use this post as a launch point) and consider the humbling possibility that some of the instances of plagiarism in their classrooms may have stemmed from teaching practices as opposed to student dishonesty or laziness. Hjortshoj and Gottschalk explain that, in order to successfully combat plagiarism in the classroom, “you need to understand what plagiarism is, in its diverse forms, why it occurs…, and what kinds of teaching practices make these violations of academic writing standards uninviting and unnecessary” (118). The teaching practices that Hjortshoj and Gottschalk reference here as possible suggestions to head plagiarism off at the pass are not necessarily additional checklist items to squeeze into an already crowded curriculum. Ideally, the kinds of practices that would help oppose plagiarism in the classroom would be the same ones that we would use to help students develop strong, flexible writing skills. Hjortshoj and Gottschalk state that, “most of the strategies we have recommended for orchestrating the research paper are also strategies for preventing plagiarism of all kinds” (Teaching English 119). The Council of Writing Program Administrator’s statement on best practices concerning plagiarism supports this by encouraging classroom strategies that simultaneously support students “throughout their research process” and “make plagiarism both difficult and unnecessary.” If educators could find a way to implement positive and rigorous academic writing instruction strategies that also directly undermined student motivation to misuse sources before that opportunity for misuse presented itself, the problem of plagiarism would shrink to a much more surmountable issue. Student writing skill would grow, teacher anxiety would decrease, and the student-teacher relationship as it pertains to the issue of source use in academic writing could work towards a much more positive and healthy condition. Howard aptly summarizes the crisis surrounding the problem of plagiarism by saying, “In our stampede to fight…a ‘plague’ of plagiarism, we risk becoming the enemies rather than the mentors of our students; we are replacing the student-teacher relationship with the criminal-police relationship.” Her statement concisely captures my motivation in posting this series on plagiarism. Through this blog series, my goal is to propose that we fight plagiarism in a different way than we have been. My goal is to encourage and explore proactive approaches that mentor and coach students into a flexible ability and skill level with source use, making plagiarism in the classroom obsolete. My hope would be to move away from the criminal-police relationship that governs the way we handle plagiarism in order to replace that relationship with one of mutual understanding, respect, and generative productivity. As a teacher with limited experience, I am sure I have nothing more than a tenuous grasp on the staggering magnitude of this undertaking; however, in my next and final post in this series, I’ll be calling on some much more experienced educators to help compile concrete ideas on how to practically bring this kind of an approach to plagiarism into the classroom. 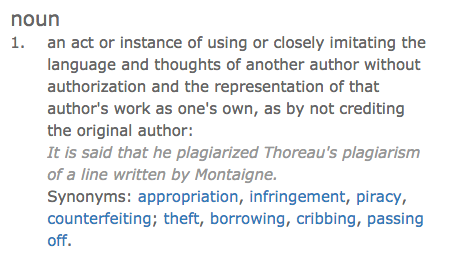 In my last post, I attempted to investigate and complicate the way in which we commonly define plagiarism. It is impossible, however, to discuss a more multifaceted understanding of plagiarism without then going on to consider how that understanding complicates our assumptions as to why students plagiarize. When we perceive plagiarism to very simply be cases in which students “steal” the words or ideas of others in order to pass them off as their own, we reduce the list of potential motivations down to laziness and deceitfulness. Either a student couldn’t be bothered to complete her own work or she just wanted to cheat the system and get away with literary theft. If, however, we are going to consider plagiarism as occurring over a spectrum, as we did in my prior post, then we must be willing to consider the corresponding spectrum of situations and rationales that might prompt students to engage in these different kinds of plagiarism. In her article in the Chronicle of Higher Education, Rebecca Moore Howard captures the danger in a simplistic rationale for why students plagiarize, saying, “by thinking of plagiarism as a unitary act rather than a collection of disparate activities, we risk categorizing all of our students as criminals.” It is not only demoralizing and harmful to minimize all our students in this way; it is also inaccurate according to the often-quoted-in-this-blog Keith Hjortshoj and his co-author Katherine Gottschalk. In their own classroom experiences, Hjortshoj and Gottschalk found that instances of plagiarism did not “correspond with integrity among the students” (Teaching Writing 118). Drawing from their time teaching, they recount many instances in which an ethical and motivated student committed some form of plagiarism. When reflecting on the numerous occasions in which they had to respond to plagiarism in their classrooms, Hjortshoj and Gottschalk say, “while all of these cases involve misrepresentation, their motivations and implications can be entirely different” (Teaching Writing 118). Several recent scholars and organizations have begun theorizing on what exactly some of these different motivations might be. Based on their research, I have compiled a list of just a few alternative reasons students could have for committing some degree of plagiarism. A General Lack of Ability: Jennifer Rabold has said, “I see plagiarism as an issue of students trying to enter the academic conversation unskillfully.” For a motivated student who wants very much to succeed in an assignment, but who does not have the skills to do so, it may be easy to either intentionally or unintentionally rely too heavily or incorrectly on outside sources. As part of the process of further investigating this idea, the Council of Writing Program Administrators (WPA), Hjortshoj, and The Citation Project have identified a few specific skills-based pitfalls that students may fall into when attempting to incorporate outside information and voices into their writing. Inability to Critically Read and Summarize Complex Sources: Work done by The Citation Project shows that, when citing sources in their papers, students summarized an outside work only 6% of the time, “indicating that they either could not or would not engage with extended passages of text.” The Citation Project’s position on this is that plagiarism is unavoidable in situations where students are not able to critically read and interact with complex sources. Lack of Established Personal Voice: When writing within the different academic disciplines, students are developing and exercising the ability to write using different voices and lenses required by the individual disciplines. Students are being asked to write as experts in particular fields on particular topics, even though writing from that perspective and in that manner is very unfamiliar for them. (I discuss this in more depth in my post on disciplinary literacy.) This lack of familiarity can cause students to lose track of where their ideas and words are original and where they borrow from outside sources. Hjortshoj and Gottschalk explain this by saying, “The difficulties novice writers face in establishing an authoritative voice and position can make the task of quoting and citing real authorities very confusing. Many students therefore drift into minor forms of plagiarism because the approach they have used does not give them a sense of position from which they can easily distinguish their ideas and voices from those of other writers” (Teaching Writing 119). Cultural or Language Difference: American school systems and academics have a very specific understanding of what is appropriate and necessary when attributing credit for ideas and words. This understanding is not objective and it is not shared equally on a global basis. Hjortshoj and Gottschalk point out that “in some cultures… repeating what authorities say is almost a definition of learning.” It is understandably difficult for students coming from an international or multilingual background to understand what it means or why they would be asked to “take an independent or original perspective, especially when they truly have learned from others everything they know about the subject, including the language required to discuss it” (Teaching Writing 119). Time Constraints: The modern American student has more demands on their time and attention than ever before. A 2008 New York Times article reported that a high-performing high school had to enforce a lunch period after their students became so entrenched in extra-curricular activities, AP classes, and part-time jobs that they were skipping their midday meals. The expectations on students to build resumes and accumulate accomplishments at an overwhelming rate have only grown since this article. The WPA points out that students may make time-management or planning errors and “believe they have no choice but to plagiarize” in order to meet important deadlines. This list is in no way meant to be comprehensive. My only goal is to offer some different options to consider when thinking about why students fall into plagiarism. While I emphatically acknowledge that blatant and intentional literary theft does indeed occur and demands response, I am attempting to advocate for the increasing number of student writers who authentically struggle with the ethics and complexities of citing sources. In my admittedly limited experience and untested opinion, students are generally trying to learn, create good work, and live up to the expectations that are placed on them. The increasing levels of plagiarism in the academic system are much less an indication of decreasing interest levels and morality among students than they are of a sharp incline in the complexity of navigating outside sources. The internet’s limitless access to an impossible range of sources makes choosing, interacting with, and incorporating those sources a very challenging task. This challenge is layered onto the already-difficult undertaking of composing a piece of academic writing. Hjortshoj and Gottschalk identify that this process is, for almost all novice writers, characterized by “helplessness and confusion” (Teaching Writing 120). Based on some of the research summarized in this post, it appears to be the case that this helplessness and confusion can fairly easily lapse into an incorrect use of the works of others. I believe it is up to modern educators to remain sensitive to the variety of reasons students engage in different types of plagiarism. This sensitivity is what leads to effective responses to plagiarism when it does occur, which is what I plan to address in my next post! As I suggested in my post introducing this series, one of the primary sources of our trouble with plagiarism in the classroom centers around the way we define it. Our impulse is to resort to the standard dictionary definition, which simplistically holds that plagiarism takes place when writers try to “use the words or ideas of another person as if they were your [their] own words or ideas.” Unfortunately the concept of assigning credit for or ownership of words or ideas is much more complex than this concise definition suggests. The general inadequacy of our reductionist understanding of plagiarism has recently prompted several different organizations and groups of scholars to work towards developing a much more nuanced and flexible characterization of what plagiarism really is. One of these groups, the Citation Project, compiles and analyzes empirical data drawn from real-life student papers in order to characterize and quantify how students use sources in their writing. Based on their research, they point out that plagiarism as we define it is really only ever practically used as a legal term in order to enforce penalties in cases of blatant dishonesty. However, according to Citation Project findings, if we focus too heavily on the legalistic and punitive definitions for plagiarism, we “are forced to ignore the more nuanced-and much more frequent- misuse of sources that may be the product of ignorance, carelessness, or a failure to understand the source.” Unless we are going to focus our teaching efforts with regards to plagiarism entirely on retroactive and punitive approaches, the definition we currently rely on is not, in most cases, tangibly helpful or applicable for use with our students. Keith Hjortshoj and Katherine Gottschalk reflect on the struggle to characterize and define source misuse by saying that, “the offenses most colleges [and schools] include in the loose category of ‘plagiarism’ vary from deliberate theft and fraud to minor cases of close paraphrase and faulty reference” (Teaching Writing 118). When it comes to practically responding to the wide array of incorrect source use seen in the classroom, our definition of plagiarism becomes inadequate and is of no real use at all. In response to this dilemma, several attempts have been made to counteract the common black-and-white definition of “literary theft.” The Council of Writing Program Administrators has released a statement on best practices which urges educators to see plagiarism as “a multifacted and ethically complex problem.” The Citation Project has developed a definition of “patchwriting” that reflects “more nuanced definitions of misuse of sources that exist side-by-side with but separate from definitions of plagiarism.” Among this work, what I have found to be the most effective alternative to our common understanding of plagiarism has come from the plagiarism prevention company, Turnitin. Turnitin has released a study in which they define different types and degrees of plagiarism along a spectrum of severity based on student intent. 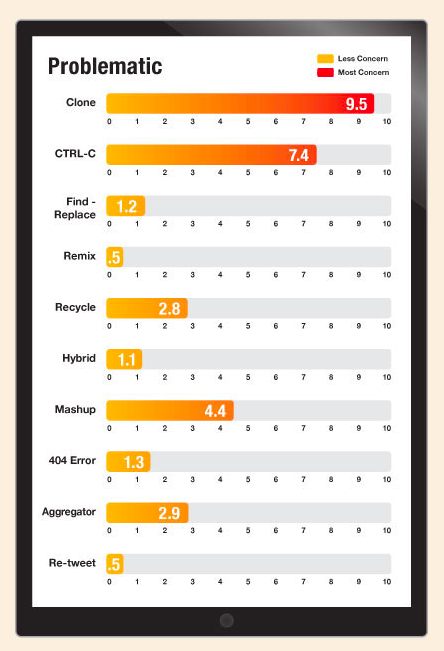 The image below is taken from the Turnitin study and captures the types of plagiarism as they fall on the spectrum of student intent; the types of plagiarism are ordered from the most to the least severe. The most problematic form of plagiarism, representing the most severe end of the spectrum, is called “cloning” and occurs when a student submits “another’s work, word-for-word” as their own. The least problematic form of plagiarism, representing the least severe end of the spectrum, is called “re-tweeting” and takes place when a student “includes proper citation, but relies to closely on the text’s original wording and/or structure.” The Turnitin study goes on to define 8 other types of plagiarism that fall in between cloning and re-tweeting, offering the frequency with which these types of plagiarism were seen along with examples of what this type of plagiarism would look like in student work. This fairly detailed overview of student source misuse covers a wide range of student intents, misunderstandings, and ethical choices, effectively undermining the depiction of plagiarism as a straightforward, objective offense. In studies like the ones discussed in this post, we see plagiarism being described as a much more complex and multifaceted obstacle to education than it has been in the past. As more organizations like Turnitin, The Citation Project, and The Council of Writing Program Administrators work to collectively define the problem of plagiarism, a more complete and comprehensive picture of how and why students misuse sources in their writing emerges. This increasingly meaningful and practical understanding carries a wealth of implications for educators in the way we communicate responsible source-use and idea-generation to our students. In the following installments of this series, I am going to be exploring some of these implications and how we as educators can employ a more nuanced and personalized understanding of plagiarism in our own classrooms.